My, @matigo had been chatty on here. Think I may have missed a few posts from just after I went to bed. @matigo that's quite a jump in price. ? Also we need a "cancel" or "clear" button for the Blurb entry @matigo. Especially when you accidentally touch a "reply" button. ? 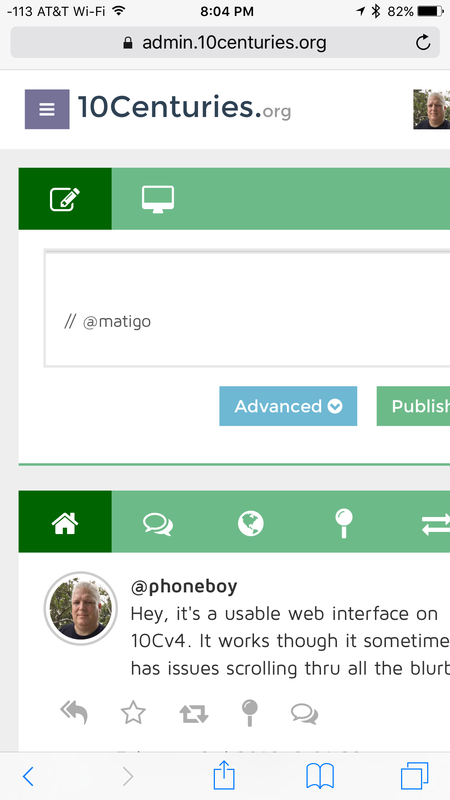 CSS error or something @matigo, the interface is just slightly larger than the screen width. Hey, it's a usable web interface on 10Cv4. It works though it sometimes has issues scrolling thru all the blurbs. @matigo is the yearly fee going to be something similar to 10Cv2 or? @matigo How so? Doesn't seem all that fantastic on my Son's 5, seems "okish" on my 5s. @matigo I actually think we'll need a form factor/paradigm shift change before we'll see a viable "third choice" for Mobile OS. Call me a pessimist.